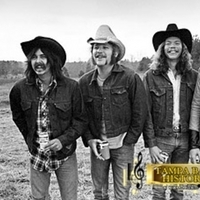 Two of John Gellman's classic 1 black and white photographs of The Outlaws, taken in late 1974 in a field outside Athens, Georgia, while the band was in town for a week playing a club called Between The Hedges. 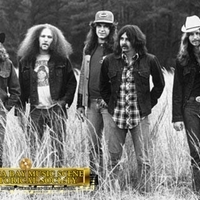 The first photograph features all five members wearing cowboy hats. 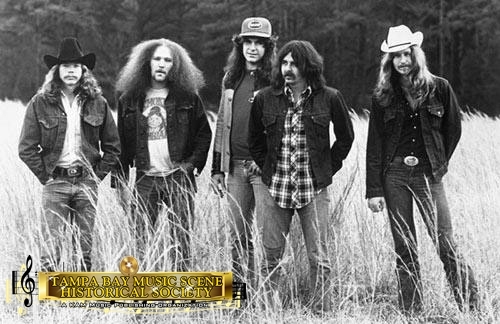 From left to right, the photograph features drummer Monte Yoho, bassist Harvey Dalton Arnold, guitarist Hughie Thomasson, guitarist/keyboardist Billy Jones, and guitarist Henry Paul. From left to right, the second photograph features Jones, Thomasson, Paul, Arnold and Yoho. Digital reproduction of Original black and white photographs. 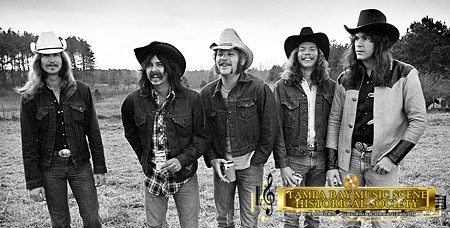 http://www.tampabaymusichistory.com/resources/the-outlaws.jpg. Originally created by John Gellman. Copyright to this resource is held by John Gellman and is provided here by RICHES of Central Florida for educational purposes only. Gellman, John. “Monte Yoho, Harvey Dalton Arnold, Hugh "Hughie" Edwards Thomasson, Jr., Billy Jones, and Henry Paul of The Outlaws.” RICHES of Central Florida accessed April 23, 2019, https://richesmi.cah.ucf.edu/omeka/items/show/5474.